I keep talking about how I’m so ready for fall to be here, and when Freddy got me these adorable Toms that feeling was amplified even more! While I love blush pink and other soft neutrals year round, I really do love rich fall colors. Rust, burgundy and olive green are just some of my favorites that I love to incorporate into my wardrobe during this time of year. Since it’s still too warm out to wear layers, shoes are the best way I can still try to be excited about fall! I haven’t gotten a new pair of Toms in at least 5 years; I wore them a lot in college but they’ve always been one of my favorite comfort shoes to wear. I’ve even worn them at Disneyland all day and my feet felt great! This paisley pattern is so cute and fun for fall—Freddy did such a great job picking them out! I also love the leather stitch trim around the bottom. It just adds a little extra detail that makes them feel more special than a regular pair of classic Toms. These are also the perfect transitional fall shoe while we’re still in the 100’s over here in Arizona. While I would love nothing more than to start wearing boots right now, I just can’t bring myself to do it when it’s so hot! 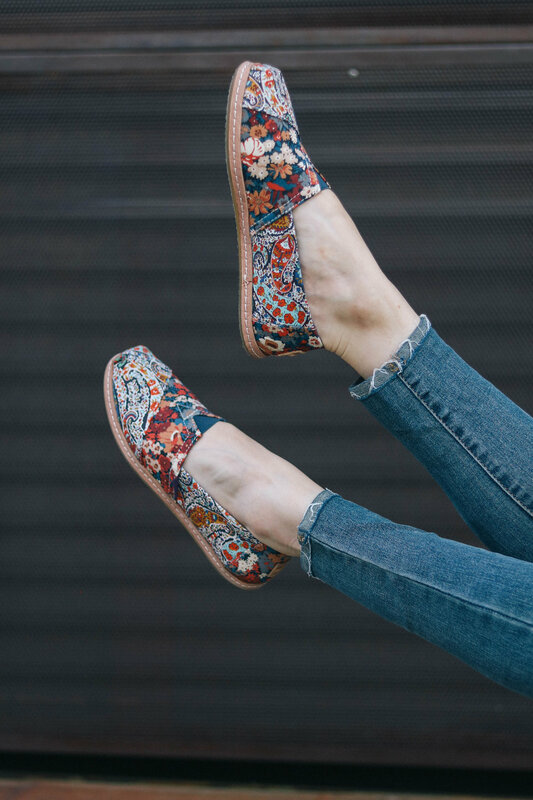 And at the same time I feel like I can’t wear my espadrilles or sandals anymore because they are too summery—looks like these will be my go-to shoe until the weather cools down more! What are you most excited to wear this fall? If you follow me on Instagram then you may have seen the most beautiful coat I found yesterday! I’m going to be so excited when I can finally wear it! !